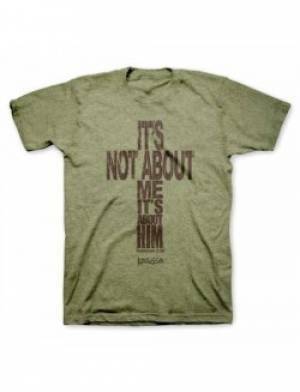 Feel closer to Christ as you wear this "It's not about me it's about him" t-shirt. An army fatigue-green coloured t-shirt with a caption saying 'Its not about me its about him' in a large capitilised brown font in a formation to show the shape of the cross. "I have been crucified with Christ and I no longer live, but Christ lives in me." -Galatians 2:20. It's Not About Me T Shirt: Adult Small is published by Kerusso and is our 45757th best seller. The ISBN for It's Not About Me T Shirt: Adult Small is 612978271803. Be the first to review It's Not About Me T Shirt: Adult Small! Got a question? No problem! Just click here to ask us about It's Not About Me T Shirt: Adult Small.